British Prime Minister Theresa May has set a clear line in the face of letters of no confidence and denunciations from her own party: she won’t relinquish her post unless it's taken from her. Driving the news: May must stare down a rebellion in her party just to secure the opportunity to present a deal that has every chance of failure in Parliament. If she fails, no one really knows what comes next. Two opponents of the deal within the Cabinet, including Brexit Secretary Dominic Raab, resigned today in protest. Eight Cabinet secretaries have now stepped down this year. Most threatening of all for May was the decision of hard-line Brexiteer Jacob Rees-Mogg to submit a letter of no confidence and call for a leadership challenge. If 48 Conservative MPs submit such letters, that would trigger a vote of no confidence. 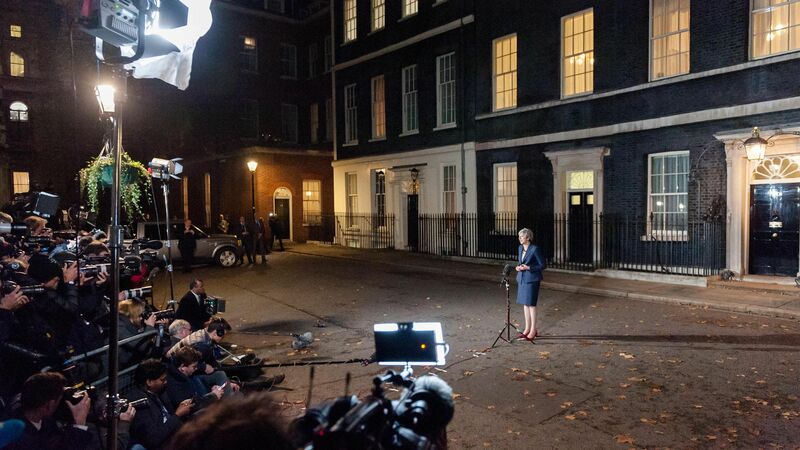 In a bid to secure her position, May offered the Brexit secretary position to Michael Gove, one of the leaders of the Brexit campaign and the current environment secretary. He turned it down. Now, he might quit the government altogether. “For Remainers, it is evident that this quasi-permanent halfway house, which will keep the UK inside the EU’s customs area and divide Northern Ireland from the rest of the UK indefinitely, would be far worse than continued EU membership." The problem for May is that together those two camps comprise the vast majority of the country and of the House of Commons. May’s coalition is divided, and the Tory train wreck gives Labour its best chance in years of taking power. “With the Labour Party, the DUP, the Scottish Nationalists, the Lib Dems and a phalanx of Tory MPs ranged against her ... the parliamentary arithmetic looks impossible,” the Economist notes. The big question: If May stumbles on either of two massive hurdles (the leadership challenge or the parliamentary vote), well ... then what? A “No Deal” exit? A second referendum? Fresh elections? The bottom line: May’s political appeal has long been, essentially, “it’s me, or it’s chaos.” This time she might be right.